Lynne Walter has commented on a previous post that she’s looking for a knitting pattern for a Pablo. I didn’t have one, but got to thinking that maybe it would be more easily created as a crocheted amigurumi. And since I also don’t crochet (yet, anyway; a friend is threatening promising to teach me) I thought it would be more interesting to see what you could come up with. Who’s up to the challenge? Create or modify a knitting or crochet pattern to make a cute little Pablo. I’m sure I can come up with some sort of prize package for the winner. I have all kinds of craft related books and magazines, and a healthy stash. Any questions? I don’t want to slap a deadline on it because we’re all so busy right now and it might just be discouraging to think of one more thing to have to do. But I sure would like to see what you folks are capable of. Here are the episode titles I found for Season Three at the Internet Movie Database. They don’t have air dates or descriptions, so we’ll get to fill that in as we go along. I’ve just made public a links page I’ve been working on for a while. I have several episodes to add projects for, so please keep checking back. The links will go to your finished Backyardiknits, so leave a comment on the links page if you have done something we can link to. I have to admit I’m pretty darned proud of myself. First of all, I sucked up my troubles and traveled to Taos for the Wool Festival and, as a reward, had an entertaining and educational weekend, made all the more special by a quick, many-miles-driven visit from my Hunky Husband. Granted, I have been paying the price for the extra exertion since the day I returned in the form of Attack of the Dumb Disease but that’s okay. It was worth it. Second of all, I designed, knit, crocheted, embroidered, and FINISHED The Tasha Dress. It is the first knitted piece I have ever designed from scratch. Usually, I rework a published pattern by changing the sleeves or the neckline or the length; well, you’ve got the idea. I did not do this. Granted, I made a jillion mistakes which led me to bite the bullet, rip the whole 3/4ths-of-the-way-done dress down to the hem the Saturday we were in Taos, and go down another design path BUT I did it. Behold the Tasha dress, albeit ill-fitting for the I-so-did-not-volunteer-for-wearing-a-girl’s-dress Pint. It should fit its wearer just fine, just below the knees. The garter stitch hem allows it to be turned up for now and tacked down and then undone as the little one grows. And the initial design problem? The all-important flowers. I think I told you before I planned on an intarsia/fair isle mix knitted into the base of the dress. Apparently, I am not good enough to do this yet. 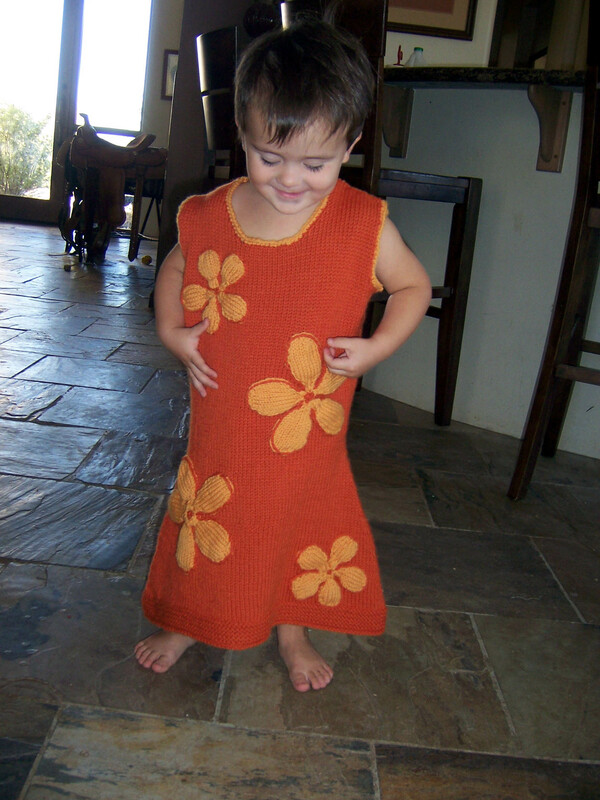 The knitted decreases in order to shape the A-line distorted the flowers and, besides, they did not have that innocent child quality needed for this dress. 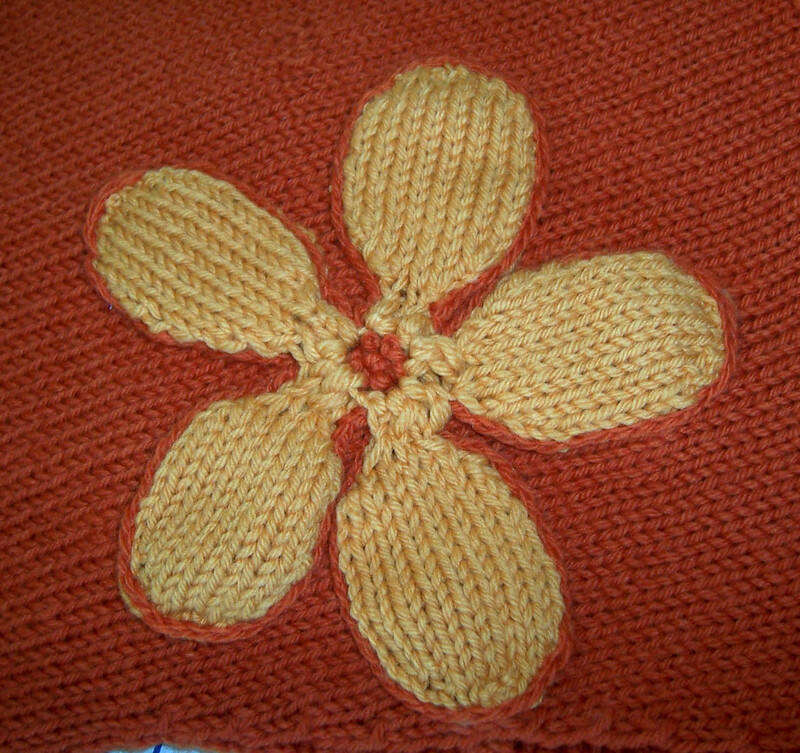 Instead I re-knitted the deep orange base by itself and worked the flowers separately. Then I embroidered them in place with a chain stitch and added French knots in the center. I like them. I sure hope the wearer does. A sense of completion is such a strange and rare thing for me. I think I like it but I have to admit I’m already missing my creation. Hopefully, she’ll like her new home in Texas and make an already special toddler feel that much more so. Alert! Alert! The premiere of Super Secret Super Spy, a double-length Backyardigans episode, will be Monday, September 17, at 7pm Eastern time. All the Backyardigans will be playing, so you’re sure to see your favorite character. SPOILER ALERT: If you’re the type who just can’t wait three days, look for a review here that will spill the beans on the entire plot. Also, the DVD will be available in stores on September 18. Keep your eyes open for potential knitting projects! Yesterday I finished the in-the-round torso portion of my Tyrone sweater. 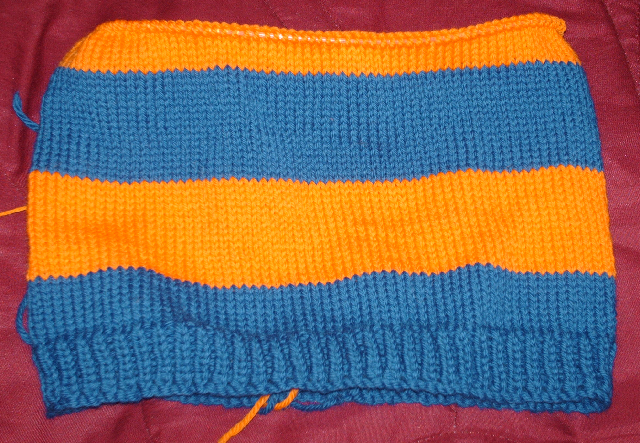 I stopped halfway through an orange stripe. (Isn’t that convenient?) Now it’s time to cast on for sleeves. I plan to just knit the same number of rows in each color, and hopefully that will make everything look like it goes together in the joining round. I have made two sweaters before, but they were to the Guideposts pattern where you knit two T shapes and seam them together with a boat neck. So I’m in new territory now but the torso was a quick knit (especially for me) and the sleeves shouldn’t take long. We’re moving this weekend, and school will start right after Labor Day, so I don’t know how much knitting time I will have. But I’ll keep you posted. Another Tyrone sweater has already been requested by the 8 y.o., but I think I will make his sweater in his new school’s colors. Here’s a link to a site that found us last month. I hope they change “Laura” to the correct “Lauren” but otherwise I was really amused by the review. I wonder what they’ll say when we show some knitting? Last night I took a look at all my various patterns for the Tyrone sweater… and started a gauge swatch. Look out world! I will also re-measure Jack today and Write Down The Numbers Where I Won’t Lose Them. I know, these are lofty goals, but I like having something to strive for. So, expect to see an exciting picture of a gauge swatch within the week. What are you doing just sitting there? If you’re lucky enough to both have a little princess and enjoy The Backyardigans, it is your duty to knit that dress. When you’re done, come on back and share your masterpiece. Make sure she is wearing the dress. Since my Austin loves Austin I would like to make him an Austin T-shirt, knit of course. I’m going to order some Shine Sport from Knitpicks in the colors Sky and Butter. Not exact on the color matching, but to a 3 year old it’s all the same. I searched high and low for a knit T-shirt pattern. I am not clever enough to come up with my own – yet. Having never even knit a top before probably hinders my abilities the most. I found the “Nothing but a T-Shirt” pattern that was published in Magknits and designed by Allison at The Blue Blog. I think this will do well as a starting point. Now I will have to sit down and do the dreaded maths to figure out the color striping. Or, maybe I’ll just wing it – ha! I do wish it was top down construction, but I am a big girl. I can learn to seam! I am secretly hoping that once I actually sit and study the pattern I will be able to figure something out to eliminate seaming as much as possible. Whatever I do, I will keep you posted. Just don’t hold your breath. I’m still working on needle liberation as well; never-mind those brand new needles in the bottom of my knitpicks cart.